So you’ve made your own blog. Good for you! You’ve hopefully added content that your viewers will love, you enjoy the communication it allows and you are, with any luck, making a decent amount of cash from your blog. The question now is, how do you avoid your hard work being stolen and used by others? Content theft is a big problem in the blogosphere right now and, of course, you want to avoid being a victim of it as well. Below are some tips that will, hopefully, keep thieves from stealing the content you worked so hard on. You often see traffic signs along the road right? A copyright sign works in the same manner. It lets people know that your work is protected and any thief can, and will, be prosecuted for stealing your work, much like they would be prosecuted for speeding. Try to put the copyright sign somewhere it’s easily noticeable but not too blatantly obvious. You want potential thieves to know that your content is protected, but you don’t want to beat your loyal readers about the head with it. A big part of content theft is done through the use of RSS feeds. Content thieves can use bots to automatically steal your work and copy it elsewhere. A good way to discourage that is to use a copyright message within your ATOM/RSS feed. 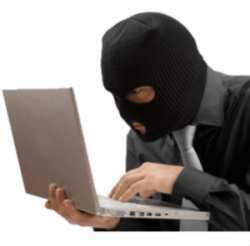 This lets all who read your content know that it’s from you, even if it’s on a thief’s website. Some copyright messages actually link to your site as well, which is a definite added bonus and further incentive for people not to steal your content. You’ve followed all the tips above and you are, hopefully, feeling pretty secure. Then you find out that, despite all those tricks, some thieves are still stealing your content. What do you do? Thankfully there are many programs and techniques you can use to find out where your content is going so you can take legal steps. 1. Probably one of the best, and easiest, ways to see if your content is being stolen is to use Google alerts. This program automatically searches Google for exact matches of your work, and shows how what sites it is on if found. So, you’ve found out that your work is being stolen and you’ve discovered exactly where it’s being shown. What do you do now? It’s quite possible that the webmaster or blogger is using your work without the knowledge it was stolen. Try to send a polite message proving to them that it is your work they are using and kindly ask them to block the original poster. This is the nuclear option of the blogosphere. A DMCA removes the offending blog from search engine databases, so that is a seriously big deal. This should only be done if the blogger or webmaster has refused to remove your content or, at the very least, refused to compensate it for you. Most search engines have electronic forms you can fill out with the proof of the theft, and will remove the website from their search database. So,these were some of the tips i personally use and recommend to others,if you have your own strategy to fight content plagiarism,do share it in the comments section.